Brownies on a Tuesday. Ummm… you down? I made these brownies on snapchat a few weeks ago (username: ambitiouskitch) and saw that several of you ended up making them and tagging me on Insta. This is giving me some incentive to post more Snapchat recipes and not just videos of my cat drinking water out of a tea cup. By the way, how was your weekend? Are you freaking out because September is nearly here? I am. It’s slowly getting a bit cooler during the evenings and the sun seems to be setting eariler each day. I’m not ready! Or maybe I am? Because September = all things pumpkin. Yet I realize we aren’t there quite yet… so today I present you with another zucchini recipe! I’m not sure if you’re excited or just plain annoyed at this point. I should have called it zucchini month on Ambitious Kitchen because it’s basically been in everything I’ve made. Now if you haven’t tried zucchini in baked goods, this is a great recipe to start with. Why? It’s easy, made in one bowl, HEALTHY and freaking delicious. I tested this recipe 5 times to reach the most perfect consistency, texture and perfect flavor. The trick is to add a tiny bit of coconut oil to the batter to make these ooey-gooey perfection. 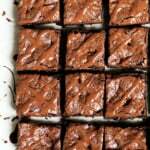 While these don’t necessarily taste like your typical buttery brownie, they are super moist and gooey, like all brownies should be. I would say that they are more of a mix between a cakey and fudgy brownie, but definitely not dense. And the raspberries really do add so much here! I used a reduced sugar raspberry jam from Trader Joe’s and swirled it in, then added raspberries on top for a little pretty presentation (plus drizzled chocolate). 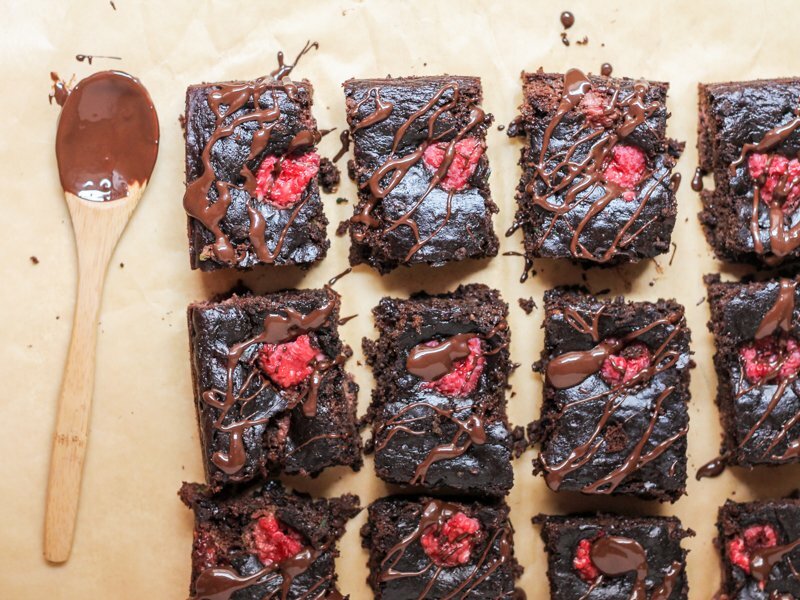 I do want to note that I did test a batch of these brownies with fresh raspberries in the batter, but they came out too moist and nearly fell apart, so if you still want the raspberry flavor I suggest using jam. 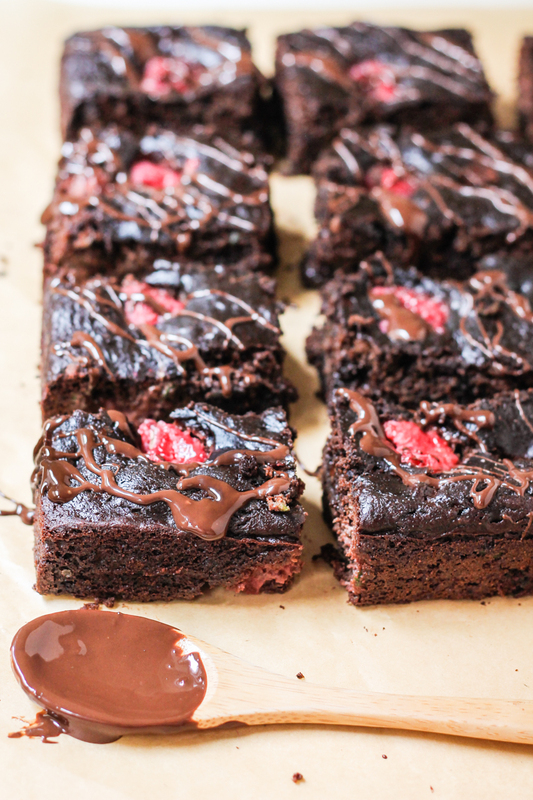 Flourless zucchini brownies with a swirl of raspberry jam and warm chocolate chips. No one can tell there's zucchini in them! Preheat oven to 350 degrees F. Grease 8x8 inch pan with nonstick cooking spray. Squeeze zucchini of excess moisture with a paper towel. In a large bowl, mix together zucchini, almond butter, egg, coconut oil, vanilla and maple syrup until smooth in consistency. Add cocoa powder, baking soda and salt. Mix until just combined. Stir in about 1/2 of the chocolate chips. Pour batter into prepared pan. Spoon jam by teaspoonful onto the top of the batter then take a knife and swirl the jam into the batter a few times. Bake for 20-25 minutes or until toothpick inserted into the middle comes out almost clean. 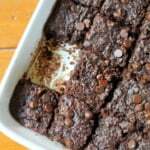 Remove brownies from oven and transfer pan to a wire rack to cool. 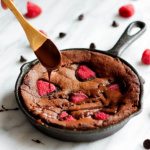 39 Responses to "Grain Free Raspberry Almond Butter Chocolate Chip Zucchini Brownies"
These zucchini brownies look amazing. Love that they use zucchini. The raspberries are the perfect complement. Ahhh I have been waiting anxiously for this recipe since seeing it on snapchat. Can’t wait to try it! Ohh girl, if you ever have extras, Omaha is pretty close by!! haha These look delicious! YUM! 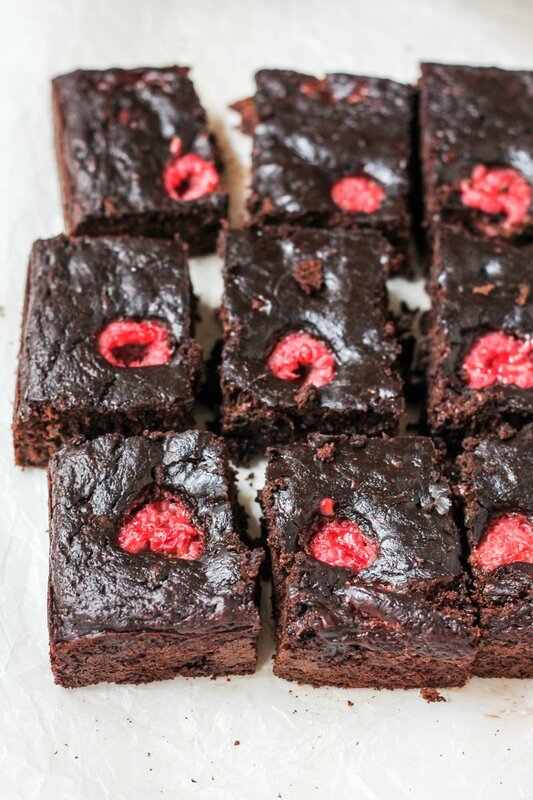 Raspberries, almond butter, zucchini and brownies?!?! And they’re grain free?! What an amazing recipe! down for brownies on any day! and perfect- i have that exact jam in my fridge (it’s my favorite for pb&js). I am pretty sure I saw you make these on Snapchat and I was dying…they look AMAZING!! 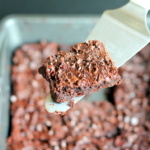 How can so much deliciousness be contained in just one brownie?? Amazing! I’m out of zucchini!!!! Noooooooo!!!!! I’ll take 3 please 🙂 YUM! I have a subsitution question: it’s almost impossible to find almond butter in switzerland, the only almond-based “fat” available is in a very liquid form and doesn’t work well with your recipes. Would it be possible to substitute with another nut butter, like peanut butter? These look sinfully decadent. 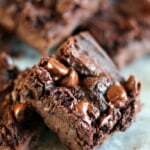 I can’t wait to make a batch of these brownies these weekend for some girlfriends when they come over for movie night. You always have the best recipes. And by the way, your snapchats are so hilarious. Yes, definitely squeeze it if your zucchini is extra wet. Instructions say to “Add cocoa powder, baking soda and SALT”, but the Ingredients list does not show salt. So sorry! 1/4 teaspoon. Updating now! YES I am freaking out because it’s almost September and I’m not ready for all the pumpkin things yet! But these babies look like exactly what I need in my life right now! While I am not quite looking forward to the end of summer… I AM looking forward to a good excuse to turn on my oven 24/7. Baker @ heart <3 most definitely. 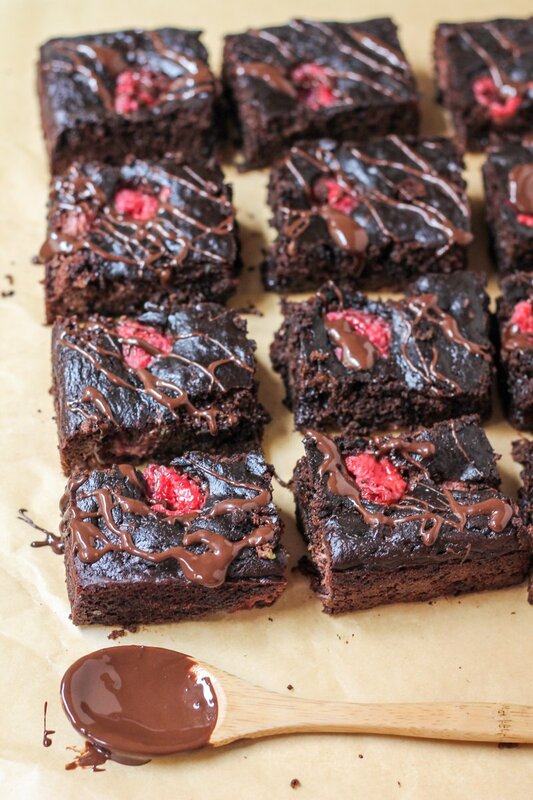 Raspberries in brownies is seriously one of my favorite treats. These look wonderful!! Can I use a flax egg instead of a regular egg ?? How can I replace the almond butter as it is very expensive here in South Africa? Peanut butter is readily available, but it has a very strong taste. Peanut butter would work fine and I think they would still taste wonderful. Can I omit the almond butter, if so, what can I replace with? Thank you! However, I do not like nut butters very much, can I just leave it out? No that would change the recipe completely, sorry! These look amazing! Do you put the raspberries on top before putting them in the oven, I assume? These look amazing and I’m sure they taste that way too. Love a new recipe that adds zucchini. My hubby will love that it’s grain free. Yes zucchini in the summer is my absolute favorite! Hope you two love these. Would tahini work in place of almond butter? It should! 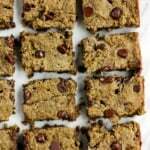 It might just alter the flavor a bit in these as almond butter has more of a natural sweetness. 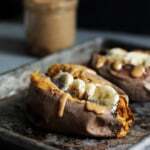 It worked with tahini and everyone loved these. I have made this recipe for my brother’s b-day. As always thank you for all your great recipes and replies to my comments/questions.